Sometimes, less is more. We already keep our order minimums low as standard because brilliant packaging shouldn’t just be the domain of big companies who are able to afford to buy in bulk. Just like we like to give back to the environment with our eco-friendly designs, we want to give something to the smaller businesses out there too. That’s exactly why until 30th April, we’re offering recyclable, custom-printed packaging designs at an amazingly low 4,000^ minimum order. Your customers love your food and their enthusiasm should be reflected in the way it’s delivered to their door. Gone are the times when fish and chips were presented on the day’s tabloid and Oriental cuisine bedded down for the journey across town in their aluminium cradles. Loyal eaters of your food shouldn’t be expected to scoop their hot, fresh ramen out of a cheap plastic tray. A quality, recyclable paper bowl with printed designs unique to your outlet will catch eyes and let customers know that your business can be trusted to give them the highest level of service from kitchen to plate. Let’s get down to the detail, then. 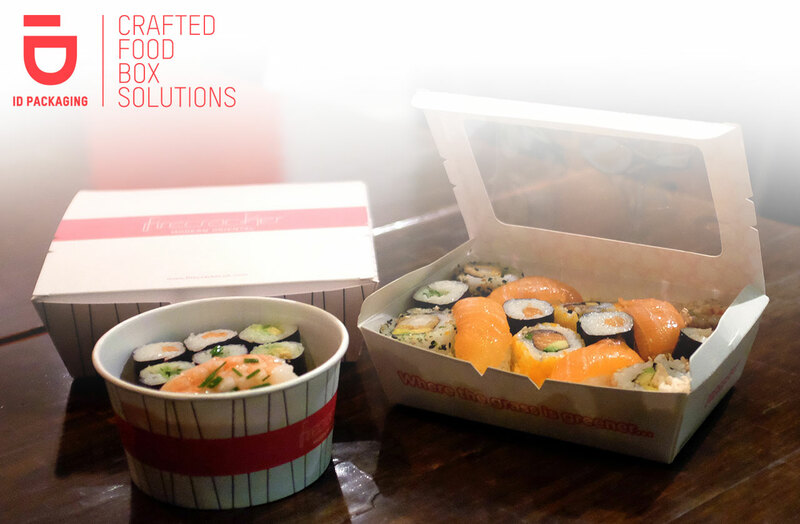 Our range includes boxes, bowls, lids and trays, always with a focus on recyclability and brand image. Ours is not a one-size-fits all approach, so each of the above come in various measurements to help serve even the hungriest of customers. At ID Packaging, the process couldn’t be simpler either. Submit your artwork using our design template, pay 50% of your overall cost and we’ll do the rest. Lead time is about 9 weeks and once your order arrives at our warehouse, settle your bill and if the total is over £150.00* we’ll even deliver it to your door for free. So, if you’re looking for a flexible way to place your next packing order and you don’t want to compromise on brand identity or quality, you’ve come to the right place. With an order minimum of 4,000, you can buy and try to see what works best for you and your customers without the risk of unused food ware piling up on premises. This deal ends on the 30th of April so get in touch to discuss your requirements fast and we’ll get the ball rolling. Once we know exactly what you need your input is kept to a minimum, leaving you free to run your business on the ground and deliver great food with style. *Free delivery for order over £150 within M25. Standard T&Cs apply.